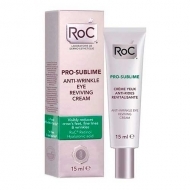 Visibly reduces lines of expression and wrinkles. 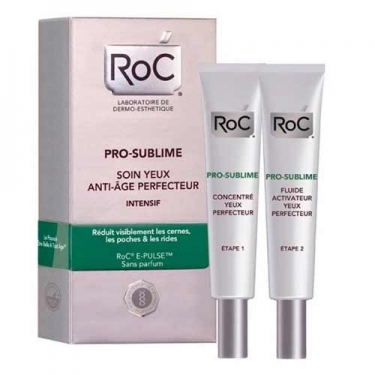 DESCRIPTION: Pro-Sublime AntiAge Eye Perfect System from RoC is a two-step care that helps to fight the major signs of age and eye contour fatigue. Visibly reduces dark circles, puffiness, and swollen eyelids, as well as the appearance of fine lines, wrinkles, and crow's feet. Exclusive E-Pulse technology with imperceptible electric currents for stimulation of skin regeneration; E-Pulse, which combines micro-particles of zinc and copper that stimulate natural cell regeneration for younger skin. Hypoallergenic to minimize the risk of allergies. Without fragrance. Ophthalmologically tested. For all skin types. Eye contour more defined, uniform, radiant and younger. Apply both creams one after the other on the eyelids and the eye contour.